Application Lifecycle Management platforms are considered essential in software development. However, they have the potential to support work in other areas too, facilitating collaboration and cutting the time and costs of managing complex projects. This eBook investigates the use of ALM outside the world of software development, and the benefits such a practice could yield. Companies adopting ALM have several benefits in mind, including enhanced collaboration; the ability to keep track of and manage all artifacts throughout the lifecycle, as well as all changes to them; the ability to implement mature processes, and more. This is particularly true if compliance with certain industry standards is vital. ALM software are used during the entire application lifecycle, from planning all the way to implementation. ALM software solutions help software development teams manage their processes and teams from the start (defining requirements) to the ned of the lifecycle (delivering releases, and organizations meeting business goals). ALM platforms were primarily used in software development, but today, ALM is present in many industries and business disciplines. 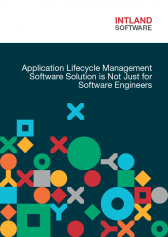 Download our ALM guide to learn why Application Lifecycle Management Software Solution is Not Just for Software Engineers. Requirements management addresses the challenges of managing a growing volume of data, and increasing complexity while providing complete traceability. Modern requirements management helps software development teams define and elaborate requirements that drive projects to success. Requirements helps determine the aim and the future development processes of all projects, and making sure that all team members understand the development steps ahead. Requirements can be anything from an abstract need to a well-described instruction, and they have many names depending on the software development methodology used. Regardless of what it’s named, requirements management is essentially a method that helps translate and transform business needs into products. Download Requirements Management Guide to increase your efficiency and revenue with requirements management.